YOURS IS THE FIST THAT WILL PIERCE THE SUN. Anyone else getting a hint of GLADOS off that butler bot? I wonder if the robot’s speech… thing… is a genuine software glitch or something Paladin put in there just for laughs. Actually any of those drinks, even the water, can be a deadly poison in sufficient quantity. Show that wussy sun who’s boss Icarus! Gah! A robot with a sense of humour! I hate those, they remind me of Claptrap. Aw. But … Claptrap! He’s the best! also: surviving getting shot. I don’t know how advanced voice synthesis is supposed to be in this world, but I really enjoy imagining that the robot isn’t using any of the correct inflections to convey that these things it’s saying are jokes. Like the programmer thoroughly enjoys messing with people. I did when he said “Deadly Poison”. It’s the cheerful cheeky smile as it says it that makes it. Show that sun who’s boss! What’s it done for us lately? I hope we get to see Paladin’s armor. Receptionist Bot has the solution to all of your needs, however sinister they may be. Haha, I’m really excited for this scene. Alison already looks like a fish out of water. Time to face those overwhelming inadequacies all us young adults try to punch into submission. The Computer is your friend. Don’t trust the Computer. You know, I believe that super scientists have a way bigger chance of changing the world than people with other superpowers. 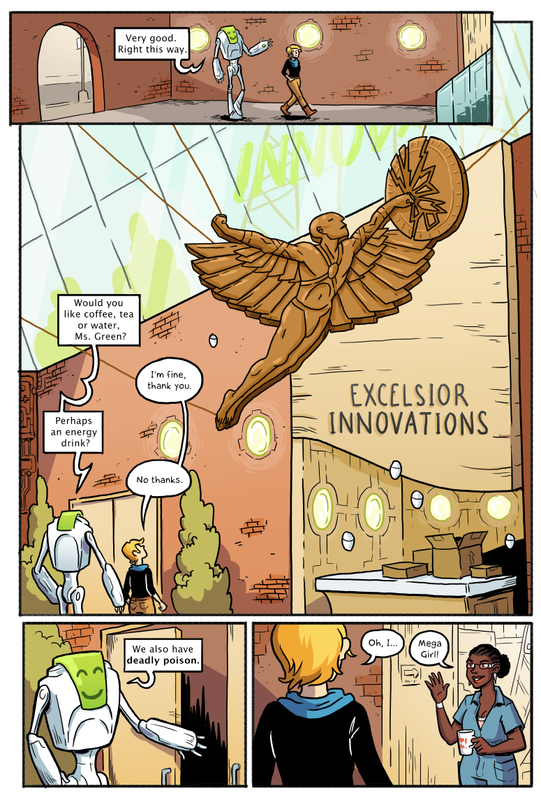 Super scientists will completely shape society with their inventions. are you planning on reflecting this on the comic? I think that’s the point. Icarus is often used as a parable about the dangers of technology, essentially accusing those who pursue higher technology of hubris. Icarus punching the sun is a rejection of that kind of Luddism. That is an excellent interpretation – I bet you got it right on! I see the intent behind the symbolism but knowing how these things tend to go in comics, I can’t help but have a bad feeling about it…. 🙁 “Everyone knows this character came to a bad end, but I won’t because I totally won’t make the same mistakes!” rarely pans out. I think the message is supposed to be “The Icarus thing is just a legend to keep us down. There is nothing we can’t do, eventually”. Alison’s invulnerable. Does that extend to poisons? I mean, if the robot’s any indication then Paladin is going to enjoy unsettling her. She should return the favour by quietly sipping a cyanide-laced tea. Was wondering about that : immortal… but what about poison gas ? what about just depriving her of O² to make her faint, if anything ? The invulnerable superhero SECURITY in Unbreakable can be drowned. Deadly Poison is to Allison like alcohol is to regular people?